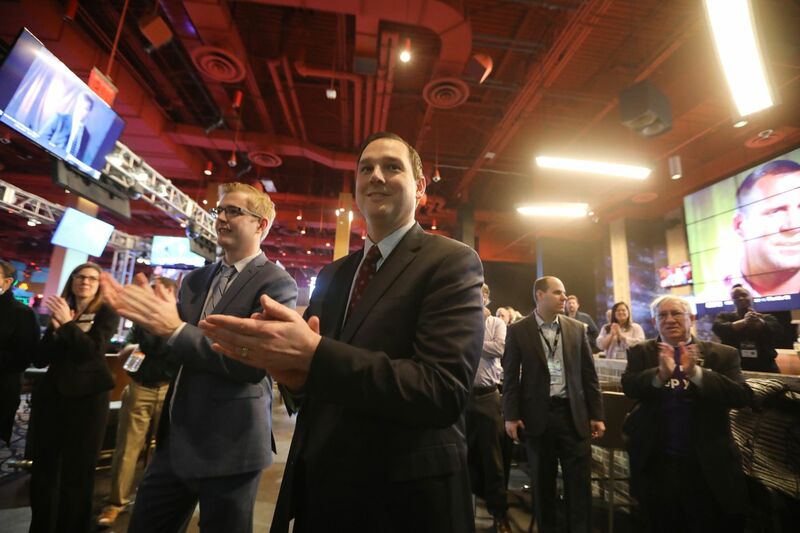 Christopher Albrecht, general manager of Harrah's Philadelphia Casino and Racetrack, applauds as the casino becomes the sixth Pennsylvania outlet to launch sports betting on Tuesday. Harrah’s Philadelphia Casino and Racetrack is taking a big swing — make that a golf swing — to reverse the long-term leakage of customers to the competition. The Chester casino marked its 12th birthday Tuesday by becoming the sixth Pennsylvania casino to offer sports betting. Its sportsbook is part of a larger strategy to reinvent the back of the casino facility to draw customers deeper into the facility, to get them to stay longer, and to spend more money. The efforts, the casino is betting, will offset the steady decline in revenue from its slot machines and help fend off competition. Slot machines, fantasy sports, mini-casinos. Where’s Pa. online gaming, a year after legalization? Harrah’s will open three golf simulators adjacent to its sportsbook in the next two months. The “Swing Suites” are small pods with lounge chairs where friends or coworkers can compete by whacking golf balls at a projection screen in “a high-energy, interactive sports and social atmosphere.” With a flip of a switch, and a different ball, the screens can be adapted to throwing baseballs, footballs or dodgeballs at zombies. The golf simulators are developed by Topgolf, which is based in Dallas and operates about 30 other Swing Suites, including some in bars, sports arenas and in other casinos, including the Ocean Resort Casino in Atlantic City. Harrah's Philadelphia Casino and Racetrack plans to open three Swing Suite golf-simulator attractions in the next few months, next to its newly opened sportsbook. The new sportsbook will undergo two days of testing supervised by the Pennsylvania Gaming Control board before a planned official opening at noon Thursday. It is the fourth legal bookmaking venue to open in the Philadelphia area, after recent launches at SugarHouse Casino in Philadelphia, at Parx Casino in Bensalem, and the Parx satellite sportsbook at the South Philadelphia Turf Club. Harrah’s says the addition of the sportsbook, the Topgolf attraction, and a new poker room are aimed at keeping customers happy and to attract new blood to the facility, where gross revenue from slot machines has declined 40 percent from $332.8 million in 2008 — when Harrah’s was the top earner of seven slots-only casinos — to $199.7 million in the 2017-2018 fiscal year, when its slots revenue ranked sixth of 12 Pennsylvania casinos. Jim Perry is first in line as Harrahs launches "The Book" at Harrah's Philadelphia Casino and Racetrack on Tuesday. He bet on the upcoming Daytona 500 NASCAR race. There’s more competition on the horizon for Harrah’s. The Live! Philadelphia Hotel and Casino is scheduled to open at the end of 2020 at the Philadelphia stadium complex, just a few miles north of Chester. And with the passage of Pennsylvania’s new gaming law in 2017, online gaming, mini-casinos and video game terminals in truck stops are likely to siphon more gamblers away from brick-and-mortar casinos. The Harrah’s facility is physically challenged because the main entrance is located at one end of a long building designed to fit next to a race track. “As you can imagine, trying to get people to come all the way through the back of the casino presents something of a challenge,” Albrecht said. So the casino is introducing three new features — the sportsbook, the Topgolf facility, and a new dedicated poker room — to encourage more walk-through traffic. “We believe the combination of these three new assets will really allow for some increased play in the overall facility, as well, on slots and tables,” Albrecht told the Pennsylvania Gaming Control Board last month. Harrah’s presented its plans to state regulators because it needed approval to remove 187 of 2,450 slot machines from the casino to clear space for the Topgolf facility, arguing that it had an oversupply of machines to meet demand. Harrah’s said its slots currently are engaged only 17 percent of the time; more than a third of the machines were unoccupied even on the busiest hour of the busiest day last year. According to gaming board records, Harrah’s average daily taxable revenue per machine was $223 last year, below the average of about $250 a day for 25,800 machines statewide. Workmen prepare the Topgolf Swing Suite golf simulation bays at Harrah's Philadelphia Casino and Racetrack. The reduction of slot machines, whose revenue is taxed at a 54 percent rate, was a concern for state regulators, particularly the Pennsylvania Horse Racing Commission, whose development fund received $240 million last year from its share of the slots tax. But the gaming board accepted Harrah’s argument that new offerings would attract more business to the taxable gaming activity, either at the sportsbook or the more than 2,000 slot machines remaining. “All these things that we do for the back of the facility there are to drive customers to play our traditional slot machines as well," Albrecht said. “You sort of have to pass a lot of slot machines on your way,” said Richard G. Jewell, a board member. “That’s part of the plan, yes,” said Albrecht. The bar at the Harrah's Philadelphia sportsbook has an unmistakable sports theme.